Situated on the left-hand side just as you enter the Main Gate of Sapporo Campus is the Information Center which also contains the Elm Forest Shop. 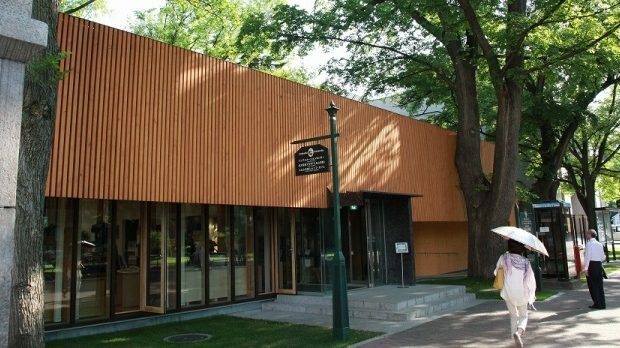 Around a seven minute walk from Sapporo station, this naturally lit glass and timber building offers the perfect introduction to the campus. So, bearing in mind our Sapporo Campus can fit 38 Tokyo Domes within its circumference… Where do you want to go today, and more importantly how do you get there? Stop by the Information Center for helpful and friendly advice. The counter of the Information Center offers a broad range of information and advice concerning the university so whoever you are, tourists, Hokkaido University staff or students, please feel free to drop in and ask away. Obtain important information about the university! The Information Center has all major university related materials, including important publications in English, such as the Guidebook, Handbook, and official Hokkaido University maps. Be sure to collect a map before you set out on the vast campus. You can also use the internet at no cost to source university related information. Our café serves amazing coffee, refreshing drinks and light meals. Before setting out in the morning or coming back from a campus tour, it’s worth taking a moment here to enjoy the atmosphere. Hokkaido University’s commitment to sustainability is evident in everything we do. The architectural design of the Information Center makes clear that the design of the facility co-exists with the forested campus and acts as a peaceful refuge from the hustle and bustle of the outside world. Taking the environment into account, geo-thermal air conditioning, photovoltaic power generation and LED lighting have all been implemented in this center. It’s all a part of our plan towards becoming a completely sustainable campus. The Elm Forest Shop was named after a major symbol of the university – the naturally growing elm tree. Since opening in this new location in June 2010, we have accommodated thousands of visitors. We look forward to your visit. After arriving at Sapporo station, it is a short walk to the main gate of the campus. If you took a JR train, upon disembarking aim for the west ticket gates and then take the north exit out of the station. Walk down the stairs, cross the pedestrian crossing and veer to the right of the Sunkus Convenience Store. Walk straight, passing the North Pacific Bank on your left, and continue for 4 minutes until you reach an intersection with a Mos Burger on the right and a car park on your left. This is the North 9, West 3 intersection. Turn left here and walk straight to the Main Gate of the campus.